Buddha Peppers & Garden Update! I spent part of today in the garden tidying up, weeding, etc. 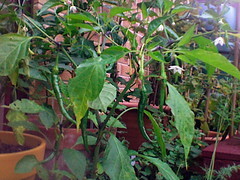 This picture of one of our pepper plants shows just how happy they have been. While not easy to tell by this photo, the plant is loaded with peppers! Other updates, the first bunch of main potatoes were dug up and although most are small, they were plenty of them! So I’m leaving the other 5 bags for a few more weeks before harvesting. And the apples on our second tree are just about ready for eating. We’ve had a couple from this tree and they are sweet and very juicy – we’re all looking forward to next years crop already!